Two software architects give their perspective on the state of software architecture and scaling it in an organization. 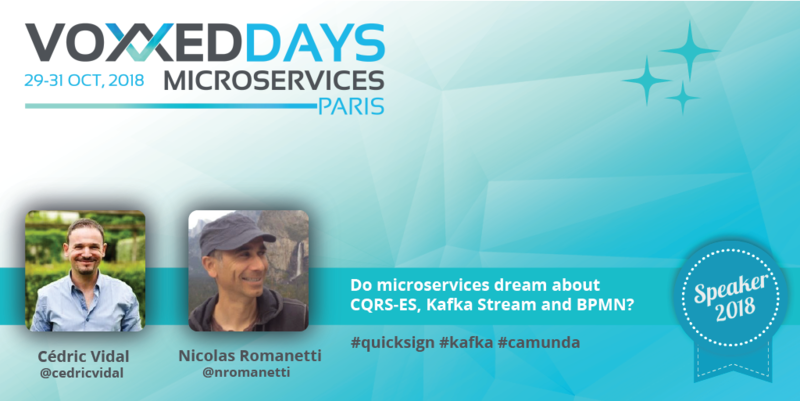 Hi Cédric, Hi Nicolas, tell us who you are and what lead you into microservices? Hi! My name is Cédric Vidal and I've been passionate about software since I got my first Macintosh SE in 1987, I was 7 and never stopped since. I've been designing numerous server architecture styles since my first monolith TCP server in 2001, searching for the right balance of agility and simplicity. I started working with Quicksign first as a consultant then as its CTO in January 2014- that's when I took on the challenge to migrate the current legacy application to a microservices platform. I had experimented various CQRS ideas on a few previous projects before coming up with our CQRS ES and BPMN microservices architecture. However, building at such a large scale within Quicksign was quite a ride! Hi, my name is Nicolas Romanetti and I am a Software Engineer with more than 20 years of experience and I currently work as the Delivery Manager on QuickSign's new platform which Cédric just described. I remember pretty well the first time I created a "microservice," it was in 1999 in Mountain View, the application I was working on at that time (Corba based, ahaha) needed some kind of flexible external extension, I came up with a simple server/http/servlet "microservice" that the application could easily invoke. OK, it was rudimentary, but it was a blast! What will you be talking about at Voxxed Days Microservices? We'll talk about how building a microservices platform at scale is a great challenge. Before going for it, you should be aware of potential pitfalls, how to avoid them and whether it matches your business case. We'll share why the microservices approach was relevant for us, how we leveraged Kafka as the backbone of our architecture and BPMN as the heart to orchestrate our microservices and Kafka Streams to implement the CQRS-ES architectural pattern. We believe these choices will lay the strongest foundation for QuickSign's growth in the coming years, we'll explain why & why it could be relevant for you. When we see BPMN written somewhere we always think of a huge monolith with business rules so complex that we need a BPMN. It looks like you've revamped BPMN to a newer look. Why choose a BPMN in your architecture? BPMN has been traditionally integrated as a monolith and advocated as incompatible with microservices architectures but we believe the contrary: the BPMN engine can simply be used as a Saga pattern implementation. It contains long running state and orchestrates microservices. We wanted BPMN to be fun and easy to work with on a daily basis, not just some irrealist architectural idealism. The tooling has changed a lot and modern products such as Camunda make BPMN pleasant to use. The ease of use of the modeler, the extensibility of the core engine, as well as the clarity of the source code (except for the core process virtual machine which is complex) and the excellent Spring integration made us feel right at home and confident that we would be able to commit to BPMN on the long run. Good, see you soon, then. Yes, we're looking forward to meeting passionate people! Feel free to come and discuss with us, we love questions and feedback. We also have interesting open positions at QuickSign in case what we do tickles your brain. DZoners! Visit Voxxed Days Microservices here to check out ticket info for the show, and use the DZone reader exclusive code: VXDMS_DZONE to get 20% off for the conference and workshop. Grab those tickets while you can, be sure to say hey to our Zone Leaders—Thomas Jardinet and Chris Ward—if you run into them at the show, and enjoy Paris! Published at DZone with permission of Antonio Goncalves , DZone MVB. See the original article here.